This application note demonstrates a study of the simulated radiation of electrically large waveguide antenna array through an electrically large highly transparent large radome in broad-side directions. Several effects lead to this highly advanced simulations: numerous WIPL-D simulation software features and the electromagnetic (EM) knowledge about functioning of the radomes. 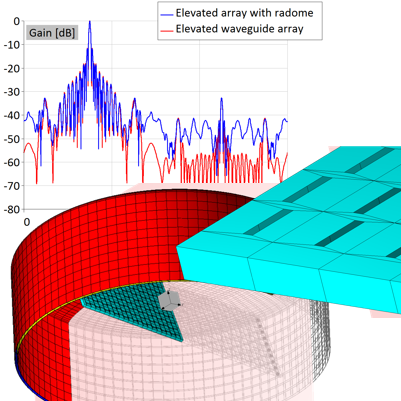 The waveguide array itself is electrically large but can be relatively fast simulated on a standard desktop PC or laptop. This is possible due to efficient WIPL-D MoM implementation based on usage of higher order basis functions, quad mesh with elements up to 2 lambdas. The EM simulation can be further improved by using widely available inexpensive CUDA enabled Graphic Processing Unit (GPU) cards and the WIPL-D GPU solver. Electrically larger 3-layer radome is added over the antenna. With the knowledge about principles of radomes and set of WIPL-D features (such as shadow reduction), GPU solver and inexpensive GPU workstation with 4 GPU cards, the EM simulation is carried out in reasonable engineering time (under 1h for the most demanding case). The three different scenarios are carefully carried out and number of unknowns adjusted: up, broadside and elevated broadside radiation.